I have a long history of failing to make 'big' cakes in my oven, but when I saw a recipe for a ring cake I remembered that I have a Bundt tin and I decided to have a go at making a cake for my dad's birthday. What else could I make for a man who thinks the 1970s were the best decade ever than a blackforest gateau, but 21st century style. Heat the oven to 180°C/160°C fan, 350°F, gas mark 4. Beat the butter and golden sugar in a bowl until smooth and creamy. Gradually beat in the eggs, a little at a time, adding flour if the mixture starts to curdle. Stir through the vanilla bean paste. Sieve in the flour, cocoa and baking powder and beat gently until smooth. Spoon the mixture into the tin and level the surface. Bake for 25-35 minutes until firm and well risen, test with a skewer which should come out clean. Place the cake in the tin onto a wire rack to cool. When cool (and not before or the cake will fall apart!) turn upside down and remove from the tin. Measure a line around the circumference of the cake halfway up the height, and carefully slice through this to have a top and bottom half. Whip the double cream up until stiff and it holds its shape. Stir through the icing sugar to sweeten. Spread this onto the bottom half of the ring, and spoon the cherry pie filling onto the top of this. Place the top half of the cake back on top. Melt the white chocolate in a bain marie (or in a bowl over boiling hot water, it shouldn't touch the water). Pour the chocolate over the top of the cake allowing it to dribble down the sides and hole to create. Place the cherries on top, and put the cake in the fridge to set. Once almost set, sprinkle the dark chocolate flakes on top (if this is done when the white chocolate is still warm, it will melt into it). Return to the fridge to set the white chocolate. Looks yummy, and I love that you've used a bundt tin! I will be using it forever from now on. Thanks, I was so pleased with it. Tea?! No no! But it did taste scrummy. Thanks for your comment. Yum! 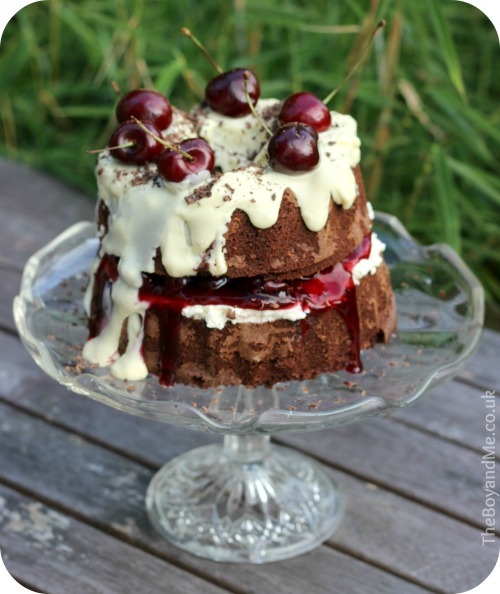 I am old-fashioned and will still prefer a blackforest cake over rich triple choc fudge mud cake or something similarly decadent. I'm the same, the cherry works brilliantly to counter the chocolate doesn't it? I must say that does look rather good. Hope he liked it. He loved it, and it tasted scrummy. It was, thanks for your comment. I need to try your trifle, it looked absolutely delicious. Oh my Lord that looks divine! A real classic, funnily enough I have been making gateaux recently too but banana based, might have to give this modern retro one a go too. Happy Birthday Dad of TB&M! Thanks, dad loved it. I'm yet to try baking a banana cake, must tackle that soon as yours was yummy. Oh wow! It looks delicious! Glad you're oven finally worked. Dad thinks it might have been because of the hole in the middle of the tin; he thinks it meant the heat was more evenly distributed. Oh yum! Could have a slice of that right now! ooo gorgeous, oozing cream and cherries, love it! I'm thinking we could count them as the dairy and fruit portions for the day? Then it would be nutritously delicious? That looks very very nice!! It really, really was! And it rose, who'd have thunked it? 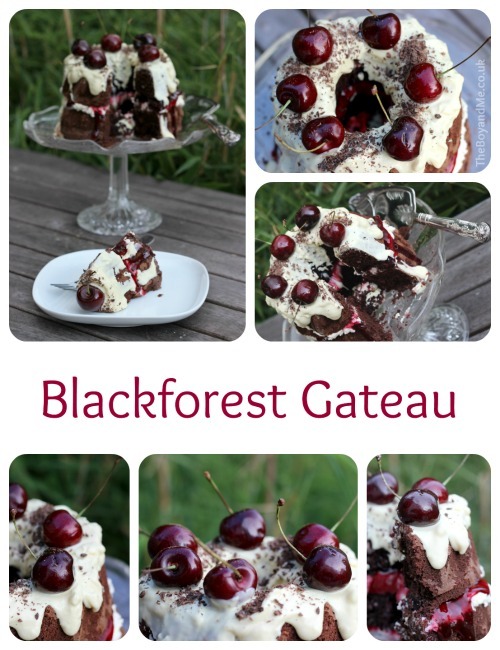 oh, I am a black forest gateau fan…looks oozingly good! Thank you, I particularly like the runny cherry sauce down the side! I don't like cream as it is, hence adding the icing sugar to sweeten it. You could ditch the cream and just use cherries and white chocolate? Wow that's stunning! Well done! Thanks for linking up to #tastytuesdays. Be great if you could add my badge too. Thanks! Thanks very much, badge added. OMG. Yum. That is all. Yum indeed, was super-duper yummy. Thanks lovely, the oldies are the best. It really was! My dad was over the moon with it too. Oh WOW! That looks amazing and I love your photo styling. Well done, lady! Thank you, can you tell I've been channelling Lucy? I've got a recipe tomorrow so will link up then. Sorry! You could just have a little slice though?